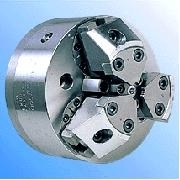 The compensating type is designed to allow the jaws to grip a workpiece at equal forces along the workpiece perimeter with respect to both center/boss holes. Two-jaw or three-jaw structure is available. All parts except the actuator are the same with those of the Centralizing type. The compensating-type UBL Chuck offers a wide range of chucking, depending on boss and center holes. Also, this type features excellent cost efficiency and great adaptability to complex-shape cutting and high-load machining, as will as high levels of accuracy and maintainability. In addition, special jaws, fixed center, reference pin, dynamic balance correction, combination design, etc. can be employed according to individual customer requirements in terms of machining accuracy, cutting conditions, and grip shape.